Hollington United Football Club manager Scott Price was ‘really gutted’ for his players after losing out in Saturday’s top-of-the-table clash. 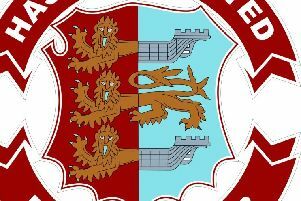 The Lions were beaten 3-0 at home to a Cuckfield Rangers side which now looks highly likely to be crowned Mid Sussex League Premier Division champions. Price said: “Really gutted for the lads today. Every single one of them worked their socks off. The scoreline flattered them (Cuckfield), but I have no complaints about the result. “The difference in the sides today and all season is the ‘goals for’ column. They’ve scored 20 more goals than us and were clinical today too. “It does help having two prolific county league players playing up top, but we also have a lot of players with county league experience. “Would Razor (Sean Ray) have made a difference? Of course. Although I thought the back three were superb, you will always miss a player of his quality. “Not only defensively, but he’s also an option to play up top when chasing the game. But let’s face it, he’s in his 70s now, so we need to get used to not having him! “They will go on and win their last few games, and will be worthy champions. “For me it’s a case of getting the boys’ heads up now as we still have a very busy month with two cup finals (including the Sussex Intermediate Challenge Cup) and five league games. “I know I say it every week, but this bunch of lads don’t just play for the club, they are building this club to where it deserves to be. “We’ve had players up at the ground all week working on the dugouts, putting scaffolding up and rolling the pitch. That’s what it means to them and that’s why I know I’ll always get 100% out of them on the pitch because they all care. “We’ve just got to make sure we get a trophy up in the clubhouse because we could still end up with nothing to show for what has been a fantastic first season (in the Mid Sussex League). Mid Sussex League Premier Division top four (played-points): 1 Cuckfield Rangers 22-58 (+57 goal difference), 2 Balcombe 23-53 (+56), 3 HOLLINGTON UNITED 21-50 (+30), 4 Lindfield 22-43 (+40). Hollington United’s remaining league fixtures: April 13 Buxted (h), April 20 Peacehaven & Telscombe II (a), April 22 Lindfield (a), April 27 Rotherfield (h), May 4 Sporting Lindfield (a).